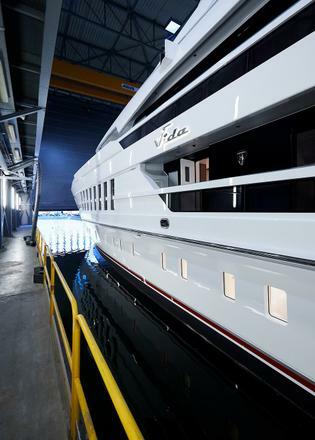 Dutch yard Heesen has revealed that its 55 metre Steel class superyacht Vida is approaching sea trials for a spring delivery. Previously known as Project Antares, the steel and aluminium yacht was launched on January 4 and was the first of five yachts scheduled for launch this year. She is now entering the systems commissioning phase before beginning "rigorous" sea trials in the North Sea for a spring delivery. 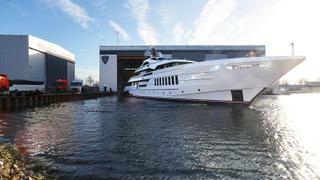 Vida is due to make her official debut at the Monaco Yacht Show after spending the summer cruising the Mediterranean. The full displacement yacht features naval architecture by Van Oossanen and exterior styling by long-time yard collaborator Omega Architects. The interior design comes from Francesco Paszkowski and Margherita Casprini, as well as Be Design Associates from Florida, which was previously known to the owner. 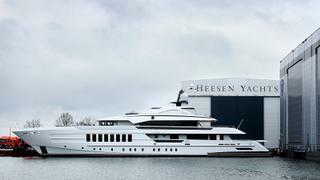 It was the first new-build yacht project for Be Design Associates who brought "fresh eyes to the project," Heesen said. The selection of materials and finishes were chosen on their environmental performance and long-term durability in the marine environment. Accommodation is for a total of 12 guests in five suites on the lower deck, as well as an 80 metre squared owner's suite on the main deck. The interior is decorated in natural materials along with a soft and warm colour palette deployed to "create a comfortable but sophisticated ambiance." One key interior feature is a backlit onyx arch in the main saloon that "will guarantee a wow effect when boarding Vida," according to the yard. Other key interior features include large vertical windows to allow plenty of light into the master suite. The yard also revealed that Vida will act as the mothership to the owner’s fleet of sportfish yachts, carrying extra fuel so that the smaller vessels can be topped up when needed. Vida will have a maximum speed of of 16 knots and range of 4,500nm at 13 knots.